Max paper size: A4. A4 standard colour print speed: 24 pages per minute. Printer type: Colour. A4 standard mono print speed: 24 pages per minute. Display: Colour touchscreen. Technology: LED. Paper output: 150 Sheets face down / 1 Sheet face up (straight paper path). This robust multifunction desktop device is easy to use and simple to set up. Colour doesn’t stop at your printouts, this machine has a full colour 9.3cm colour touchscreen display for quick and easy access to features. Print, scan, copy and fax with this Brother MFC-L3710CW colour printer. LED print technology. Print speed: up to 19ppm. 250 sheet standard paper tray. 4 in 1: print, scan, copy, fax. During that process you will be issued with an RMA number. OEM MFCL3730CDNZU1. 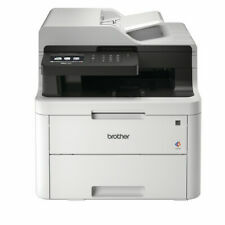 Print, scan, copy and fax with this Brother MFC-L3730CDN colour printer. The printer also features a large 250 sheet paper capacity and duplex printing as standard. Colour Grey. Mono/Colour Colour. Print, scan, copy and fax with this Brother MFC-L3730CDN colour printer. 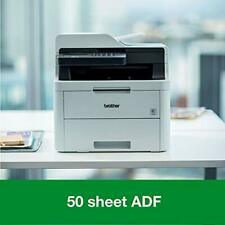 The printer also features a large 250 sheet paper capacity and duplex printing as standard. LED print technology. Print speed: up to 18ppm. Product Family: MFC. Product Type: LED Multifunction Printer. Multifunction Devices: Copier/Fax/Printer/Scanner. Form Factor: Desktop. Copy Color: Colour. Product Series: MFC. Fax Color: Colour. Print Color Capability: Colour. The user-friendly 9.3cm colour touchscreen allows you easy access features including personalised shortcuts for your most used functions. Colour doesn’t stop at your printouts, this machine has a full-colour 9.3cm touchscreen display for quick and easy access to features. Product Family: MFC. Product Type: LED Multifunction Printer. Multifunction Devices: Copier/Fax/Printer/Scanner. Form Factor: Desktop. Copy Color: Colour. Fax Color: Colour. Product Series: MFC. Print Color Capability: Colour. This robust desktop device is designed to be set-up and working straight from the box. With the large in-box toners giving you up to 1,000 pages , and built-in wired network for quick and easy connectivity, this device is ready to support all busy offices. Brother MFC-9320CW All-in-One LED Printer, collect at London w24qp. London w24qp. This robust multifunction desktop device is easy to use and simple to set up. Colour doesn't stop at your printouts, this machine has a full colour 9.3cm colour touchscreen display for quick and easy access to features. Model: MFCL3710CWZU1. Kikatek Code K1073394. MFCL3710CWZU1 Brother MFCL3710CW A4 Colour LED 4-in-1 - MFCL3710CWZU1 (Printers > Multifunction Printers). Multifunction Printers. Inkjet and Photo Printers. Laser Printers. Dot Matrix Printers. Other Drives and Storage. MFCL3770CDWZU1 Brother MFCL3770CDW 4-in-1 Colour LED :: MFCL3770CDWZU1 (Printers > Multifunction Printers). The security algorithms supported are the ones that can be used with this product. - Intuitive connection to the Cloud. OKI 45850603 OKI MC853DN MFP 4 in 1 A3 Colour Networked LED Printer. Model: MFCL3730CDNZU1. Manufacturer's SKU MFCL3730CDNZU1. MorePrinters & Scanners products. Kikatek Code K1073395. Model: MFCL3750CDWZU1. Kikatek Code K1073396. MFCL3730CDNZU1 Brother MFCL3730CDN Colour LED 4-in-1 :: MFCL3730CDNZU1 (Printers > Multifunction Printers). The security algorithms supported are the ones that can be used with this product. 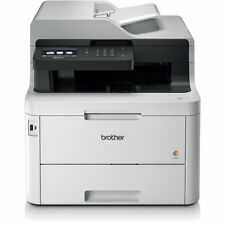 Brother MFC-L3730CDN. Buy Brother MFC-L3750CDW Color LED All-in-One Printer featuring Print, Copy, Scan, Fax, Max Resolution: 600 x 2400 dpi Print Speed: 25 ppm. Review Brother. Direct Printing Apple AirPrint, Google Cloud Print, Mopria, Wi-Fi Direct. A4, 2400 x 600 dpi, ADF, 25-400%, Fax, 45 dB(A), 9.398 cm (3.7") LED Display, WLAN 802.11 b/g/n, USB 2.0. Print speed (colour, normal quality, A4/US Letter) 19 ppm. Print speed (black, normal quality, A4/US Letter) 19 ppm. MULTIFUNCTIONAL / COPIER, Color Laser Multifunction Printer, Multifunction Copier / Fax / Scanner, Brother Mfcl3750cdw. Speed: Up at 24 cpm (copies per minute) color. Resolution: Up to 600 x 600 dpi (ADF), Up to 1,200 x 2,400 dpi (Flatbed), Up to 19,200 x 19,200 dpi (Interpolated). MULTIFUNCTIONAL / COPIER, Color Laser Multifunction Printer, Multifunction Copier / Fax / Scanner, Brother Mfcl3770cdw. Wireless network interface: IEEE 802.11b / g / n. Wired network interface: Ethernet 10Base-T / 100Base-TX. Buy Brother MFC-L3710CW Color LED All-in-One Printer featuring Print, Copy, Scan, Fax, Max Resolution: 600 x 2400 dpi Print Speed: 19 ppm. Review Brother. Direct Printing Apple AirPrint, Google Cloud Print, Mopria, Wi-Fi Direct. Manufacturer: Brother. With 34ppm print speed, a 6.8cm colour touchscreen and NFC connectivity that allows you to print by touching your phone to your printer, this device will effortlessly bring your digital work to life. Product Family: MFC. Product Type: LED Multifunction Printer. Multifunction Devices: Copier/Fax/Printer/Scanner. Product Series: MFC. Form Factor: Desktop. Copy Color: Colour. Fax Color: Colour. Print Color Capability: Colour. 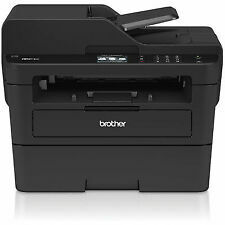 Brother MFC MFC-L3730CDN LED Multifunction Printer - Colour - Copier/Fax/Printer/Scanner - 18 ppm Mono/18 ppm Color Print - 2400 x 600 dpi Print - Automatic Duplex Print - 2400 dpi Optical Scan - 251 sheets Input - Fast Ethernet. Brother MFC MFC-L3710CW LED Multifunction Printer - Colour - Copier/Fax/Printer/Scanner - 18 ppm Mono/18 ppm Color Print - 600 x 2400 dpi Print - 1200 dpi Optical Scan - 251 sheets Input - Wireless LAN. Brother MFCL3770CDWZU1 - LED MFC-L3770CDW 2.400DPI NFC - 24PPM 512MB PRNT/CPY/SCN/FX/WIFI IN. Single-pass duplex copying and scanning and 30-sheet multipurpose tray. 250-sheet adjustable paper tray minimizes refills. Brother MFC-L3750CDW multifunctional Laser 24 ppm 2400 x 600 DPI A4. Printing Colour printing. Scanning Colour scanning. Print speed (colour, normal quality, A4/US Letter) 24 ppm. Duplex print speed (ISO/IEC 24734) colour 8 ipm.